In my editorial of the last issue vol-IV issue-1 I had thanked advocate Sanjeev Bhatnagar for bringing about a semblance of unity amongst Sindhis worldwide for raising one voice, in unison, protesting against the affront heaped on the community. It now seems there is some competition and there is one more candidate soliciting our gratitude – Hon’ble Minister of Tourism – Renuka Choudhry! Well Sindhishaan has no hesitation in extending its thanks to the Hon’ble Minister for ensuring that the SLEEPING TIGER AWOKEN BY SANJEEV BHATNAGAR – NEVER LET’S ITS GUARD DOWN AGAIN! The enthusiasm is contagious, inspiring and exhilarating. Differences have been forgotten and walls have crumbled. 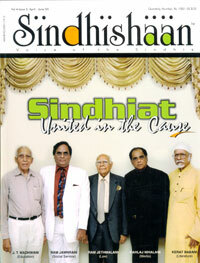 Almost every Sindhi organization is now willing and anxious to join hands with another in a concerted effort for a common objective – THE CAUSE OF SINDHIAT. We are equal citizens of India. I would go one step ahead and say that our contribution in the nation’s progress has not been given due credit. Besides the spheres of education and healthcare, our contribution to the exchequer in relation to our population is higher than that of any other community in percentage terms. So why are we so apologetic about our identity?